Any collection of national literature rests finally on that country’s founding myths. This is to say, literary history is the practice of legend making, and the choices behind its creation won’t be innocent, objective, or even wholly scholarly. Indeed, literary anthologies are freighted with all kinds of assumptions, from the geopolitical (in the tensions between history, land, and identity) to the generic (i.e. what counts as “literature”? Who counts as an “author” when?). 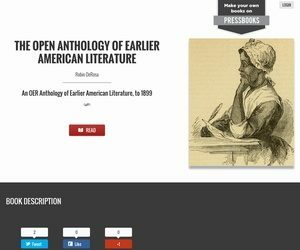 Once we situate literature as belonging to the history of a particular space,—the point of departure for both the anthology and the literature survey course it supports—any single conceptualization of, let’s say, an “Early American Literature” collection issues a statement on “American” history itself. This is inescapable and tricky, nonetheless. As a student of social movements, I tend to adopt social history as a methodological approach to the (admittedly impossible) task of covering the four centuries of literature typically referred to as “early American.” Thus, my own “American Literature to 1900” course charts some of the various, often contentious stories of “American” culture’s movements towards inclusion, emancipation, and equality. As “America” was transformed into European colonies and then a liberal democracy, from a country of farms and frontiers into an industrialized economic and military power, its literature played an important role in expanding the reading public and creating the definition of a nation. At least, this is one interpretation: mine! I embraced the open project with Rebus accepting that my inclination towards social history would color the anthology’s roster, a case reinforced in the opening draft of our Table of Contents. As expected, the sections track roughly chronologically and feature representative authors and texts. Indigenous creation stories confront European colonial documents; the early texts of New England’s Puritan pulpits are met and challenged by the voices and pens of native peoples, African slaves, and women writers. The American Revolution gives way to an explosion of social movements and an expansion of the canon stretching from Thomas Paine’s republican propaganda to the birth of African-American letters in Phillis Wheatley. The selections from the early nineteenth century include the familiar names of the “American Renaissance”—Emerson, Poe, Hawthorne, Whitman, Melville—in tandem with the literature of abolitionism. The post-Civil War sections aim to balance the significant social writings of the Gilded Age and Reconstruction era with the emergence of realist fiction. Of course, this literary historical narrative will seem familiar to scholars. It’s influenced, unavoidably, by the leading anthologies on the academic market,—Wiley’s The Literatures of Colonial America and Norton’s Anthology of American Literature—the texts that introduced me and probably many others to the field. Yet, here is the beauty of open education: our anthology is only a framework. Its historical breadth is an invitation to fill in the gaps, to collaborate, revise, and invent new conceptual possibilities for the field. Like literary history, the open anthology is a field of contestation, and as a collective, dynamic, always-unfinished project, it’s a textbook that can finally replicate the best aspects of classroom dialogue. I am noticing a gap in that James Fenimore Cooper is not among the authors you have listed. His early works, The Spy, The Pioneers, and The Prairie are important in the development of the 19th century American novel. The Spy is unique in its representation of the Revolutionary War in that it is the first novel that brought the War to center stage. To speak about early American literature without including Cooper, and his influence both on its development and on the political unfolding of the nation would be like building an arch and forgetting the keystone.